Sometimes it's easier to get everything you need at once. Store Supply Warehouse offers a complete display case arrangement which offers all of the essential display units to create a custom built-in look for your showroom floor. The set includes one of each of the following: 70"L Full Vision Display, Open Shelf Corner Filler, Well-Top Register Stand, and 48"L Service Counter. Providing years of affordable elegance and dependability the 70" fully vision display case features a low pressure melamine laminate finish with a tempered glass top, front and sides, giving your customers a full visual of the merchandise they are purchasing. Additionally the display case includes easy sliding rear hardboard doors, and anodized aluminum frame extrusions and an optional lock and lighting kit (sold separately). The 48" service counter helps your employees improve efficiency and offer the best customer service, with adjustable storage shelves for tools, supplies and store essentials. The Well-Top Register stand is capable of holding your computer screen or cash register to ensure business operates as usual. 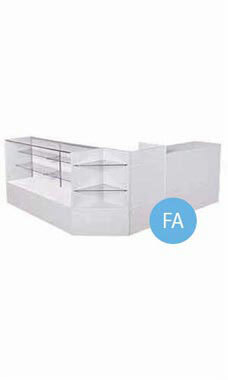 Finally the corner display filler features two adjustable shelves to offer additional display space, while tying the entire display unit together. To ensure safe shipping, all display pieces are secured in crating included in the price of the case. Ships fully assembled. Available for immediate shipment.